I’m happy to announce that MAAS 2.3.0 (final) is now available! In order to provide with sufficient notice, please be aware that 2.3.0 will replace MAAS 2.2 in the Ubuntu Archive in the coming weeks. In the meantime, MAAS 2.3 is available in PPA and as a Snap. MAAS 2.3.0 is currently available in ppa:maas/next for the coming week. Please be aware that MAAS 2.3 will replace MAAS 2.2 in ppa:maas/stablewithin a week. Machine network configuration now deferred to cloud-init. Starting from MAAS 2.3, machine network configuration is now handled by cloud-init. In previous MAAS (and curtin) releases, the network configuration was performed by curtin during the installation process. In an effort to improve robustness, network configuration has now been consolidated in cloud-init. MAAS will continue to pass network configuration to curtin, which in turn, will delegate the configuration to cloud-init. As part of the effort to reduce dependencies and improve reliability, MAAS ephemeral (network boot) images are no longer loaded using iSCSI (tgt). By default, the ephemeral images are now obtained using HTTP requests to the rack controller. After upgrading to MAAS 2.3, please ensure you have the latest available images. For more information please refer to the section below (New features & improvements). MAAS 2.3 now supports the ability to perform network configuration for CentOS and Windows. The network configuration is performed via cloud-init. MAAS CentOS images now use the latest available version of cloud-init that includes these features. MAAS can now configure NIC teaming (bonding) and VLAN interfaces for Windows deployments. This uses the native NetLBFO in Windows 2008+. Contact us for more information (https://maas.io/contact-us). An improved testing framework that allows MAAS to run each component individually. This allows MAAS to run tests against storage devices for example, and capture results individually. This provides MAAS with information about the tests themselves, such as script name, description, required packages, and other metadata about what information the script will gather. All of which will be used by MAAS to render in the UI. Determines whether the test supports a parameter, such as storage, allowing the test to be run against individual storage devices. Provides the ability to run tests in parallel by setting this in the YAML definition. Capture performance metrics for tests that can provide it. CPU performance tests now offer a new ‘7z’ test, providing metrics. Storage performance tests now include a new ‘fio’ test providing metrics. Storage test ‘badblocks’ has been improved to provide the number of badblocks found as a metric. The ability to override a machine that has been marked ‘Failed testing’. This allows administrators to acknowledge that a machine is usable despite it having failed testing. Displays a warning when the machine has been overridden and has failed tests, but is in a ‘Ready’ or ‘Deployed’ state. Summary tab – Provides hardware testing information about the different components (CPU, Memory, Storage). Hardware Tests /Commission tab – Provides an improved view of the latest test run, its runtime as well as an improved view of previous results. It also adds more detailed information about specific tests, such as status, exit code, tags, runtime and logs/output (such as stdout and stderr). Storage tab – Displays the status of specific disks, including whether a test is OK or failed after running hardware tests. For more information please refer to https://docs.ubuntu.com/maas/2.3/en/nodes-hw-testing. In order to confirm network connectivity and aide with the discovery of VLANs, fabrics and subnets, MAAS 2.3 introduces network beaconing. MAAS now sends out encrypted beacons, facilitating network discovery and monitoring. Beacons are sent using IPv4 and IPv6 multicast (and unicast) to UDP port 5240. When registering a new controller, MAAS uses the information gathered from the beaconing protocol to ensure that newly registered interfaces on each controller are associated with existing known networks in MAAS. This aids MAAS by providing better information on determining the network topology. Using network beaconing, MAAS can better correlate which networks are connected to its controllers, even if interfaces on those controller are not configured with IP addresses. Future uses for beaconing could include validation of networks from commissioning nodes, MTU verification, and a better user experience for registering new controllers. Adding upstream proxy support also includes an improved configuration on the settings page. Please refer to Settings > Proxy for more details. MAAS 2.3 introduces an improved design for the machines, devices and controllers detail pages that include the following changes. “Summary” tab now only provides information about the specific node (machine, device or controller), organised across cards. “Configuration” has been introduced, which includes all editable settings for the specific node (machine, device or controllers). “Logs” consolidates the commissioning output and the installation log output. Added DHCP status column on the ‘Subnet’s tab. Updated VLAN and Space details page to no longer allow inline editing. Updated VLAN page to include the IP ranges tables. Added warnings when changing a Subnet’s mode (Unmanaged or Managed). Renamed “Device Discovery” to “Network Discovery”. Discovered devices where MAAS cannot determine the hostname now show the hostname as “unknown” and greyed out instead of using the MAC address manufacturer as the hostname. 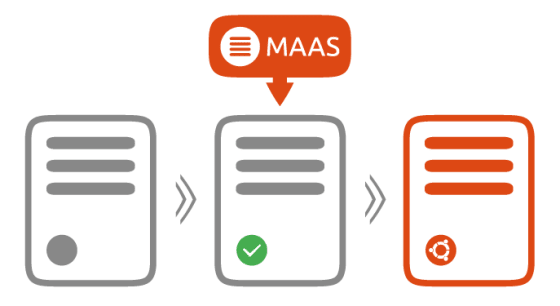 MAAS 2.3 can now automatically deploy rack controllers when deploying a machine. This is done by providing cloud-init user data, and once a machine is deployed, cloud-init will install and configure the rack controller. Upon rack controller registration, MAAS will automatically detect the machine is now a rack controller and it will be transitioned automatically. To deploy a rack controller, users can do so via the API (or CLI), e.g: maas <user> machine deploy <system_id> install_rackd=True Please note that this features makes use of the MAAS snap to configure the rack controller on the deployed machine. Since snap store mirrors are not yet available, this will require the machine to have access to the internet to be able to install the MAAS snap. MAAS now surfaces the version of each running controller and notifies the users of any version mismatch between the region and rack controllers. This helps administrators identify mismatches when upgrading their MAAS on a multi-node MAAS cluster, such as within a HA setup. The machines API endpoint now provides more information on the configured storage and provides additional output that includes volume_groups, raids, cache_sets, and bcaches fields.